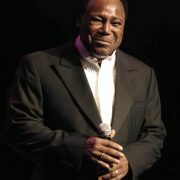 George Benson will release a new album, Guitar Man, on October 4. As its title implies, the 12-song collection finds Benson, who is both a renowned jazz guitarist and pop-jazz vocalist, bringing his main instrument to the forefront. Accompanying Benson on this recording is a team of both veterans and newcomers: pianist Joe Sample, keyboardist and musical director David Garfield, bassist Ben Williams and drummer Harvey Mason. For the project, the crew came together in the studio with a minimum of prior rehearsal time, what Benson describes as an “old school” approach.